Skookum has many popular products, but their TB series of trawl blocks are among their most popular. 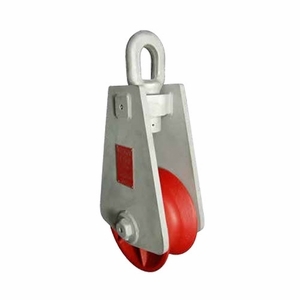 Built to withstand the rigors of commerical fishing, these blocks feature work-hardening manganese steel sheaves to maximize wire rope and sheave life. Each block is equipped with tapered roller bearings for long life in higher line speed applications. The swivel eye is designed with thrust bearings for ease of rotation, even under load. The block body itself is galvanized for a durable and corrosion-resistant finish. Available in four different sizes. Made in the U.S.A. Safety factor of 4:1.